City Hall() Years of sustained planning effort have finally paid off as the City of Birmingham formally announced its 100th master plan yesterday during a Linn Park ceremony. The plan was emblazoned on the side of the Jefferson County courthouse using sophisticated laser projection techniques, while Mayor Bernard Kincaid read over the list of names and organizations responsible for getting us this far. Bright red stars twinkled next to each item on the plan as Kincaid marched on, describing each point in detail. The results of the visioning process, which allowed citizens to rank each point in importance, were reflected in the star ranking system. Though only a non-representative fraction of the metro-area's residents participated in the planning process, the star ranking system was nonetheless impressive. Larry Watts of the BPRC then stood and led the assembled audience through a detailed history of master planning in Birmingham. 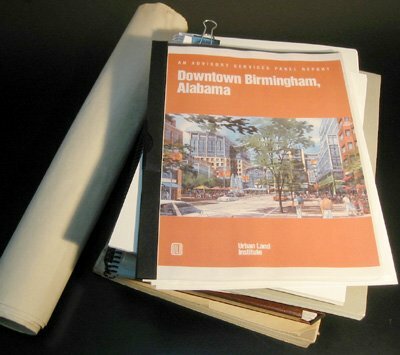 Memorable plans from The Birmingham Ecoplex, to John Katapodis' Vulcan to Zoo Monorail, to Region 2020, to the all encompassing Vann Plan were remembered with glowing reverence. Each of these plans was a good one, but each was faulted for its lack of completeness. The latest plan, drawn up by a consulting firm from Atlanta, Georgia, is unique among all previous plans in that it includes both a Hope VI project and classy strip clubs as the main elements. "We had never before had that powerful combination on one sheet of paper," said Watts. The effect of such careful planning is evident in the success of revitalization efforts in the midtown and downtown areas of Atlanta. "The Cheetah always brought people down there," said Atlanta consultant Jim Durrett, "but they never before had a place to live." That changed in 1996 when the Olympics made way for high-rise dorms and mixed income housing to replace the historic Techwood homes project. The success of that Hope VI project has even spawned a luxury loft boom in the industrial-warehouse area along Marietta Street. "That is something we are hoping to see duplicated in Birmingham," said Durrett. "After the classy strip clubs get put in place." Phase I of that effort is already complete, The Furnace having opened last year to rave reviews. Some Japanese businessmen have even compared it favorably to Atlanta's Diamond Club. Tuscaloosa(KW) Following the success of the stirring epic "The Return of the King" at this year's Academy Awards, many of the individuals portrayed in the film have begun to search for new employment. The timing could not be better for the University of Alabama whose once proud football program lies in shambles. Head coach Mike Shula was fired last week after a dismal four and nine season. His brief tenure was marred by controversy over an oft-stated desire to emulate the accomplishments of Jennings 'Ears' Whitworth. A despondent Shula is said to have remarked, "I didnt even get a chance to use my two free murders." Luckily, university trustees hit upon an immediate coaching replacement during an impromptu screening of ROTK. "It became apparent that we were looking in the wrong place," states University of Alabama president Andrew Sorenson. 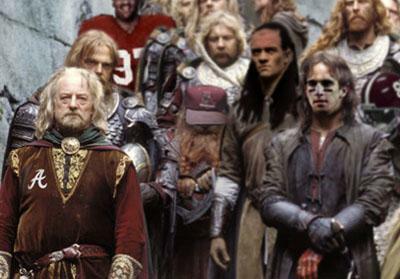 "After we watched those boys come from behind to win at Gondor, I knew our next coach had to be King Theoden of Rohan." The son of Thengel is a relative newcomer to the game of football but many feel that his stirring Bryantesque speeches more than make up for his lack of experience. As a recent immigrant to the U.S., Theodens religious views have been the subject of a great deal of derision. Coach Theoden, or 'Theo' as he is affectionately known, is a self-admitted pagan. Sorenson dismisses the criticism as irrelevant. "I dont care if hes into black magic or witchcraft. Hell, Id even hire a Catholic." Sorenson latter apologized for his last remark and reaffirmed the universitys tough stance against papery. Jay Barker, former UA quarterback, football analyst and Christian, is among the kings staunchest supporters. "I like the way he came out of that middle-aged slump and led his guys to victory. Hes a lot like coach Bryant was back in '73". At his swearing in ceremony, the king expressed his devotion to an 'old school' coaching philosophy. "Crush your enemies, see them driven before you and hear the lamentations of their women." Reservation Lands() The financial roadblock standing in the way of Birmingham's first linear greenway has just been eliminated. The Railroad Reservation grounds between first avenues north and south soon will become a public walking and biking park thanks to guaranteed revenue to be provided by a new $400 million casino. Ten percent of casino profits will go directly to the City of Birmingham. Chief Harlan 'Big Cat' Bordesley, spokesman for the Railroad Council, says that the decision is a good one for both the city and his people. "The land is ours, but we agreed to give some money to the city for building the park and access trails that will hook us into the pedestrian flow coming from B&A Warehouse and SYSCO. Once they have that built, I assume the ten percent per year will go to education or something." 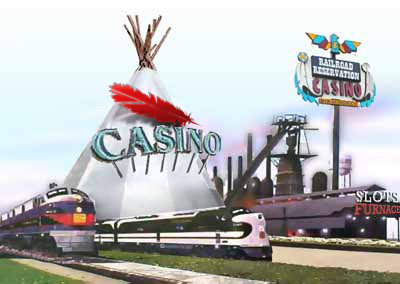 The Railroad Council has hired Chief Red Feather to manage the casino and book entertainers into the 'Big Tepee'. The first show will be Red Feather himself, performing Native American dance rituals and play-acting a wild west shoot-out complete with a cast of "depitty's". Ringling Brothers wants to continue using one of the tracks when they are in town and will perform in the 'Big Tepee' rather than the BJCC. This will put an end to the traditional circus parade of animals, but the linear park will allow people to get much closer to the performers' sleeping cars. Most of the casino will be built directly on the tracks, but will be wider than a normal railcar. Although it will not actually be mobile, there will be periodic boarding and unboarding cycles during the day, just like on regular trains. Boarding cycles will be accompanied by an enormous flashing neon sign that will be visible for miles around. The sign will flash green on days when there have been no gambling related suicides, and red otherwise.